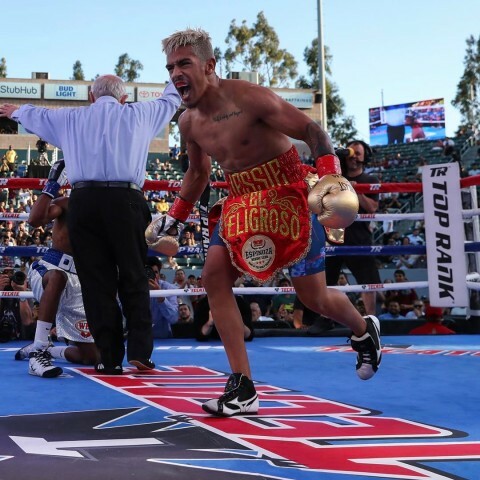 Inside of the StubHub Center, Magdaleno (25-0, 18 KO’s) proved himself to be too much for Dos Santos (18-3, 14 KO’s), as he buzzed him with a right hand in the second round that began the Brazilian fighter’s downfall. A left hand from Magdaleno dropped Dos Santos moments later, and despite rising, he was overwhelmed by the onslaught coming from the champion and was sent to his knees after absorbing a left-right combination to the head. Referee Dr. Lou Moret waived the contest off at the 2:51 mark. Mandatory challenger Cesar Juarez was sitting ringside and we’ll likely see him and Magdaleno in the ring together in the near future.